This flooded suction centrifugal pump is suitable for use with saltwater, chemical transfer (please consult factory for specific chemical compatibility and other pumping applications that deal with corrosive substances). High-tech, non-corrosive plastic construction. All metal components that have contact with liquid are stainless steel. Motor shaft is completely insulated from any contact with pumping liquid. Mechanical seal has ceramic and carbon faces. All other parts are buna-n-rubber and stainless steel. 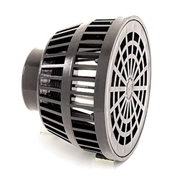 Patented air cooled heat sink allows pump to run dry or in loss-of-prime conditions without damage to the shaft seal. Unconditional two year warranty against seal failure. Floating eye seal on the impeller maximizes pump efficiency for best flow and pressure. Will accept either a standard 1.5-inch union or a male 1.5-inch pipe thread. Unions must be ordered separately. UL and CSA agency listing do not apply to any application other than water applications. Dimensions: 14.19" x 7.75" x 6.5"